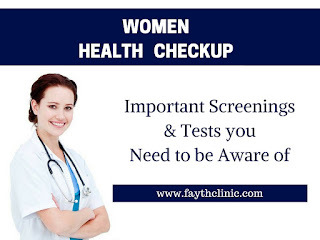 Women must take a general health check up at each and every year. As a part of it, you may need to discuss with your doctor about medical and family history. 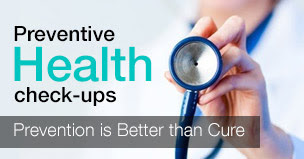 Regular Health Checkup, exams, and tests will help you to find the health issues before they start. They also help us to find problems early, In the case of women, they need some extra screening test. Some disease such as cardiovascular (heart disease), diabetes, some types of cancer can be identified in their early stages, then the treatments will be more effective. Pelvic Exam : type of an exam to check the female internal organ’s size and shape. Pap Test : type of test to check cancer of the cervix. Clinical breast exam : to identify the breast cancer. Blood pressure : After an age of 18 you must check your blood pressure at every two years. If you have any family history of high blood pressure, it is better to test more frequently. Blood Test : Check your sugar and cholesterol level. If you are over 45 you should have these tests at every year or two. Rather than simply treating the disease , Fayth Clinic offers awareness programs too which in a big way help patients to prevent them in future. The hospital provides all types of health checkups for women like Blood Pressure, Blood Test and Weight Checkup etc. If you have any doubts regarding women health issues or check up contact our experts through on-line chat service in our website.